I have a burning desire to have ginger copper hair so I've started the process. Dyed my hair this copper shade last week. Waiting to see how it fairs in a few washes so I can decide if I want to go lighter and by how much. My hair always lightens after a few washes and as I haven't washed my hair since dying it I don't know what the colour truly looks like yet. Looks pretty dark but with a reddish tint right now. 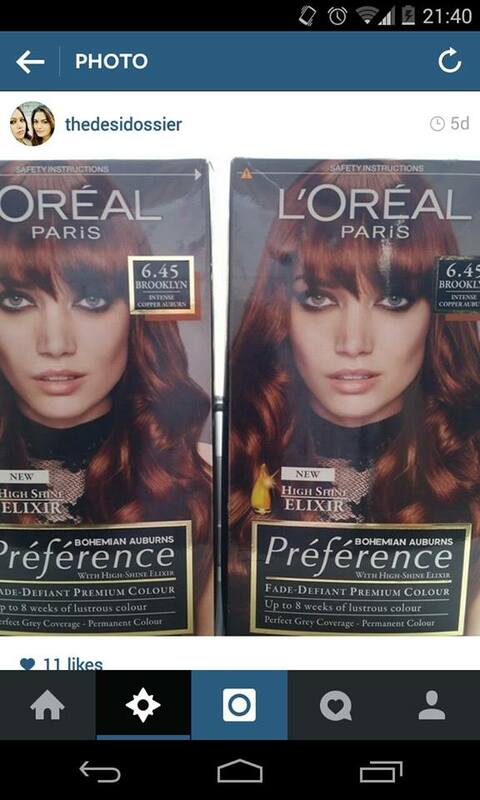 If you dye your hair and it appears darker than the colour on the box, don't panic and be patient. Give it a couple of weeks to show the true colour before deciding what to do. I do want a copper shade with some highlights through it. As I'm writing this I now want to have an iced chocolate colour. Urgh. When it comes to hair dyes I am a L'oreal girl through and through. I've tried pretty much every at home hair dye kit out there and none have ever done what it's supposed to do (to my hair). I always have great results with the L'oreal ones (minus the Sublime Mousse, which I thought was pants on my hair, absolute pants). Plus I love the conditioner it comes with. You are supposed to use to once a week for 6 weeks post hair dying but I use the entire tube when I wash out the hair dye. It leaves hair so soft and silky. The hair dye smells strongly of ammonia, which I think is good because then I know it's strong enough to change the colour of my hair, but obviously if you're really sensitive to scents then be aware. L'oreal Preference Extreme Platinum is what we use to ombre Nigar's hair if you guys were interested. We've used it a few times and her hair is till going strong. I think next week is going to a hair week on the blog. I'll be posting my current hair oil mix, favourite shampoos, co-washing, and an Ethiopian hair secret for soft, luscious locks. If I get a chance to take photos I'll probably do a post on my hair everyday, just to share the greatness that is of not washing your hair too much! Do you have any request for hair related woes? Am working on a huge hair post( *in my head *) and any requests for what bothers you most about your hair is most welcomed. Or if you have a great hair weapon do share that as well. Dandruff Management and Receding hairline for women :( can u do a post on them ? ?